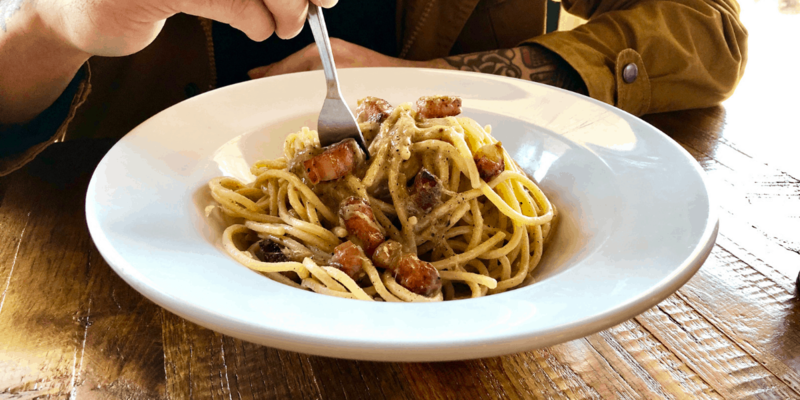 Previously on the Due’ blog, we spoke about our passion for cooking traditional dishes like carbonara and amatriciana the right, traditional way with guanciale. We explained how we make our own in house from an authentic blend of spices and WA sourced pork. We’re adding another menu item which uses this special ingredient for your to enjoy it’s rich flavor: pasta alla gricia. This dish is another ancient dish from Roman cuisine, which is commonly considered the mother of all Roman pastas. There are different stories about the origin of the name gricia. The most widely known is that it is derived from the name of the village where the pasta is said to have originated, Grisciano. Another theory is that the word gricia is a bastardized version of grigio which means gray. This might be referring to the gray cast left on an iron skillet from frying guanciale. Other theories range from the name grici, the inhabitants of the origin area. One interesting story claims that Grigioni, a medieval name for the German and Swiss bakers who came to Rome and cured pork, is the origin of the word and dish. These bakers were quite hard working and this dish was a simple, fast favorite of their lifestyle. With an origin like this, pasta alla gricia should be a perfect fit for our hardworking American lifestyle as well! All of these old histories may hold a piece of the truth; we may never know. What really matters is how this dish has captivated generations of Italians and now pasta lovers around the world for literally thousands of years. It’s simple, yet rich in flavor recipe has secured its place as a timeless classic. To make pasta alla gricia, it’s quite simple: pecorino romano cheese, black pepper, salt, and our guanciale. It’s incredibly short ingredient list is packed with powerful flavors that work beautifully in unison. This simple, powerful dish is perfect for a satisfying lunch in the middle of your busy day; just like the origin stories suggest! Come in and join us this week for a perfectly crafted plate.